I've recently become enamored with dip pens. I love the look and texture of it. I even love the whole ritual of it. I admit that cleaning of the nibs is a bit of a pain especially when using fast drying ink, but there's something so fun about dipping your pen in a bottle of ink and just seeing where the ink goes. So above is my test run with the pen. 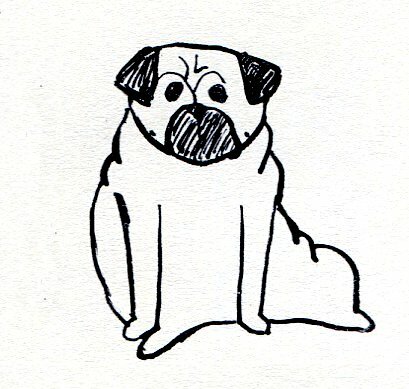 I didn't have anything in particular to draw so I looked over and saw my pug doing her classic pug slump. I'm excited to try out more with this pen, mistakes and all. It'll be a lot of trial and error but I'm looking forward to it!